Take a bow, Shah Rukh Khan, raves Raja Sen.
Who could do this film but Shah Rukh Khan? Conceptually, the basic idea propelling the narrative of Maneesh Sharma’s Fan appears deceptively simple -- that of an obsessive fan, a bit of a cross between Misery and The King Of Comedy -- and, judged from the surface, this film works like a slickly efficient Darr homage. Yet, behind the thriller-movie makeup it wears, there is so much more to Fan, a film that should be hailed for its satirical sharpness and for its subtle subversion. And it deserves to be celebrated for the way it allows the world’s biggest movie star to cleverly lampoon his own absurdly, inevitably inflated legend. For this is a film where Shah Rukh Khan crowns himself his own greatest admirer. Lookalikes don’t often resemble the celebrities they attempt to ape. Styled to accentuate a passing resemblance, they more often than not look like a wonky wet-watercolour version of the real thing,something sculpted with less finesse and more raggedy edges. The fleeting moment of doppelgänger magic only takes place if and when they manage to find precisely the right light, the right angle and the right expression -- for that one instant, the star’s the limit. Limit isn’t a word too familiar to Gaurav Chanana, a West Delhi cybercafe owner who dreams Mannat-sized dreams. The young boy bears a squint-your-eyes resemblance to the country’s biggest star, Aryan Khanna, and it is this similarity that fuels his haircut, his body language, his hopes and deepest desires. 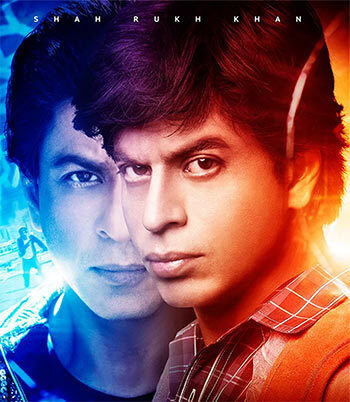 The fact that both these characters are played by Shah Rukh Khan is a revolutionary move, immediately setting this film apart from films like The Fan that it may well have been inspired by. Chanana’s voice is thin, chirpy, eager, but it is when he puts on Aryan’s voice (the first words he mouths in classic SRK fashion are also, tellingly, the title of an underrated Shah Rukh film, Dil Se) that despite his being visibly a low-rent clone, the crowd believes in him. They wilfully hold the scales up to their eyes because they want, for a moment, to buy into even this blurry similarity. Gaurav,on his part, believes solely in Aryan. His obsession with the star might not be purely platonic -- he once shyly expresses a desire to be part of an item song with the superstar, and later refers to him as the love of his life -- though it may have transcended such base desires. All he wants, he claims, is a hug. His earnest but naive methods to acquire said embrace are tremendously misguided, and a disgusted Khanna makes it clear he wants nothing to do with him. Having now found his supervillain origin story, the heartbroken and vengeful Gaurav decides to aggressively go after Aryan with all the rage of a lifelong devotee who has finally discovered his god’s feet of clay. Sharma stays warmly and affectionately sympathetic toward the likeable fantill he snaps, after which the film goes darker and yet begins to appear more conventional. Don’t be taken in -- Fan is never a template film, especially when it begins most to resemble one. This a film full of long and elaborate chase sequences, but these exist both ironically, in order to skewer the constant implausibility of Bollywood action set pieces, and, more crucially, to blur the line between fan and star: Can anyone do what the man on the big-screen can? Yes, literally anybody can -- and, for the most part, they can do it better. Throughout the action there are clues to how blind faith in cinema steers you wrong. Gaurav, for instance, leaping from parapet to parapet in order to escape cops, begins to line up an impossibly filmi jump onto anair-conditioner grill only to be stopped in mid-air by a suddenly open window while a tubby cop lands on the grill and plunges to peril. In another action scene, set at the Madame Tussauds’ gallery in London, things escalate wildly while a near-perfect approximation of Salman Khan stands by waxily, watching and naturally doing nothing. It is a well-crafted, finely cast film, with significant performances from actors like Yogendra Tiku and Shriya Pilgaonkar, set against that precise Delhi detailing Sharma is so good at. Cinematographer Manu Anand plays up both similarities and the lack of similarities between the two protagonists with great skill, his camera often slithering around them in compellingly framed close-ups and over-the-shoulder shots. There are times the film, written by Habib Faisal and with dialogues by Sharat Katariya, blurs the line enough for us to mistake one character for the other, and this is not lazy writing but indeed poetic. People taking pictures around waxworks of famous people, for instance, are only too glad to believe that the guy who kinda-sorta looks like an actor must indeed be The Actor. The difference between the two SRKs is pronouncedly stark in one scene, but they completely, creepily, coldly turn on the exact same amount of charm in the next. Khan’s performance is an astonishing one, credibly creating both the young hungry-eyed kid falling back in anorgasmic swoon on beholding his idol in the flesh, as well as giving us the deeper portrayal of a superstar with such a fragile identity that depends far too much on perception. Gaurav, amping up his efforts to humiliate Aryan, brings the heat to the narrative, but not nearly as much as Maneesh does, this film eating away at both the public image -- and, more importantly, the public caricature -- of Shah Rukh Khan himself. Aryan Khanna sits disgraced in a prison cell while a British goon stands and pisses a few inches away, while a few scenes later he’s convincing a wealthy businessman that he’ll perform charmingly enough to entertain every guest at a family wedding. The word bribe isn’t mentioned but the film star does give policemen money for‘expenses,’ and much later, right after a painful police interrogation, instantly, instinctively, automatically agrees to pose for a selfie with a female officer. The most scathing attacks may be saved, however, for those who misread. Take a bow, Shah Rukh Khan. Not only for a phenomenal, genuinely groundbreaking performance but for being bold enough to give us the sight of a boy wearing painted-on abs while aping you dancing in a song where you, according to rumour, wore painted-on abs. For a glimpse at a worn out 50-year-old man -- massaging his temples, and stretching at the lines on his face -- before turning on the high-wattage smile and stepping out to market his myth. Of course Shah Rukh Khan is his own biggest fan. It’s a rule that comes with the megastar territory, the need to believe in your own legend. What a film like Fan makes evident is that the rarified view from high up there may not always be the most pleasant. Especially when you’re looking at the fan in the mirror.